Home » What is a KPI? A KPI is a commonly used acronym which means Key Performance Indicator. Basically, a (KPI) Key Performance Indicator is a metric that was specifically designed to tell you whether you are winning or losing the fight to achieve your most important goals. KPIs are what companies use to compare their business processes to the industry’s best practices. KPI Fire is a tool executives can use to make an informed, data driven decision by quickly identifying strengths and weaknesses with our visual KPI Dashboard. What is the difference between a KPI and a Metric? A metric is any numerical value that represents a measurement. It is true that all KPIs are metrics; but not all metrics merit the title of KPI. KPIs are distinct and concise metrics that are essential in evaluating a company’s operations or goals. What are some common KPIs? Net Profit Margin – the percent of revenue left after expenses have been deductive over total revenue. Net Promoter Score (NPS) – the willingness of customers to recommend a product/service. Share Price – the current selling price for one share of company stock. Savings from Improvement Initiatives: (Hard Savings, Soft Savings). Employee Turnover Rate – the percent of employees leaving the company and replaced by new employees. Everyone should have these important metrics clearly defined. This is because they need to be closely monitored if you want to achieve the goals that these metrics are linked to. This sounds like a tall order, but you don’t have to fill it alone. We can help! KPI Fire provides a simple, visual way to not only see your metrics, but link all of your Goals and Projects to your Metrics as well. Click on the link below to request a demo and register for your free trial. 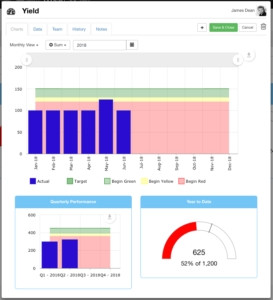 The video below shows how easy it is to use our KPI Dashboards. Itza Mostert is a KPI Fire Intern with a background in business strategy and marketing.